﻿ HuntingNut » Forums » Firearms, Shooting & Reloading » Gun & Firearm Discussions » AR Thread!! Posted: Wed Jan 06, 2010 10:27 pm Post subject: Re: AR Thread!! For Christmas, I got to convert my black gun to Dark Earth with Magpul from to back! That old 1.5x Weaver is working out just great for our tactical carbine matches. Still looking for what sling I want to get. Posted: Thu Jan 07, 2010 4:26 pm Post subject: Re: AR Thread!! Posted: Thu Jan 07, 2010 6:25 pm Post subject: Re: AR Thread!! Regarding the sling, its so light and easy to carry, I haven't really missed not having one installed. Of course that will change if I harvest a deer that is big enough to need both hands to drag it out. Posted: Thu Jan 07, 2010 10:18 pm Post subject: Re: AR Thread!! Posted: Fri Jan 08, 2010 8:31 am Post subject: Re: AR Thread!! Sapper, do you shoot any tactical matches with it? Posted: Fri Jan 08, 2010 2:56 pm Post subject: Re: AR Thread!! Posted: Wed Jan 20, 2010 6:23 pm Post subject: Re: AR Thread!! I just added a skeletonized 4# Timney . It feels great hopfully I can try it out this weekend .I think Im gonna switch out the scope with a 3-9 Nikon I have as well. Posted: Thu Jan 21, 2010 12:32 am Post subject: Re: AR Thread!! Joe, I've been looking at those triggers, can't wait for a report. Posted: Thu Jan 21, 2010 5:25 pm Post subject: Re: AR Thread!! Posted: Thu Jan 21, 2010 7:04 pm Post subject: Re: AR Thread!! You know I've been looking at how much it would cost for a AR in 6.8SPCII to be built (ie I buy the parts then try to assemble it). 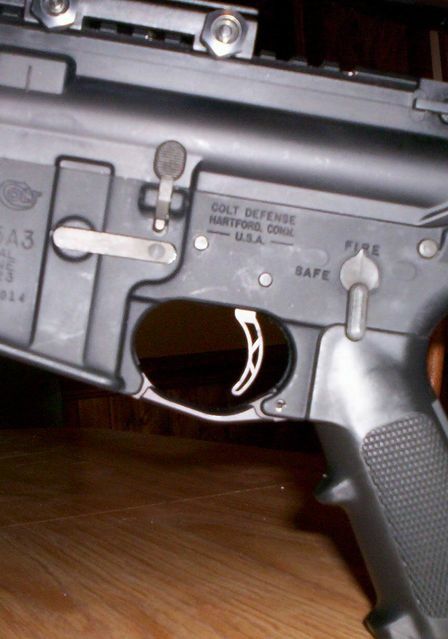 I never realized how expensive AR parts can add up to. I ended up deciding on what I'd like and I ended up with around 1,471$ as a price tag for the parts (US suppliers would need to pay for export fees ontop of that). Switching the handgaurd type (to the new MagPul MOE Mid-Length) and a 18" MidLenght White Oak barrel ended up totaling 1,565$. Now I'll admit, it is other then the barrel and handgaurd dressed up as a NM gun like RRA's using the RRA NM carry handle, trigger and front sight. But I was surprised to see how expensive these things can be, and thats not including a railed handgaurd and the like which are popular. Posted: Thu Jan 21, 2010 7:33 pm Post subject: Re: AR Thread!! Posted: Thu Jan 21, 2010 7:48 pm Post subject: Re: AR Thread!! That is why I figured I should build my own, get mine done from the start how I want it. That being said I may as well say what I am thinking about. Posted: Thu Jan 21, 2010 7:49 pm Post subject: Re: AR Thread!! 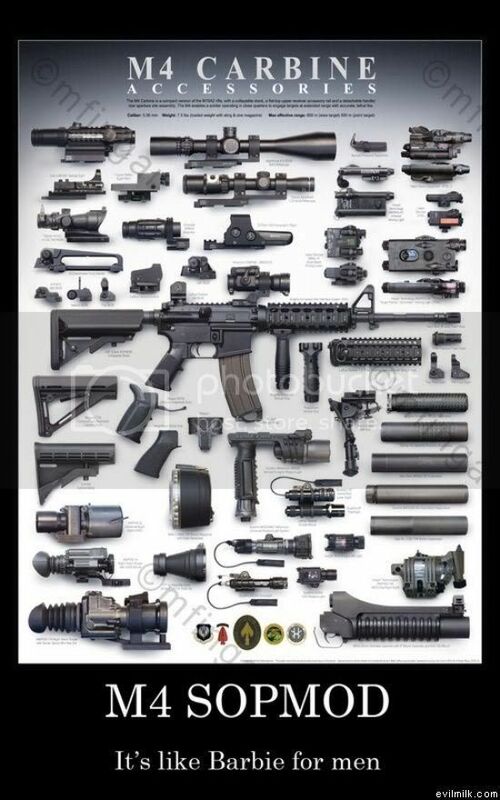 I think I've mentioned on here before that a friend told me that ARs were "the LEGO set for firearms". Posted: Thu Jan 21, 2010 7:55 pm Post subject: Re: AR Thread!! Posted: Thu Jan 21, 2010 9:47 pm Post subject: Re: AR Thread! !